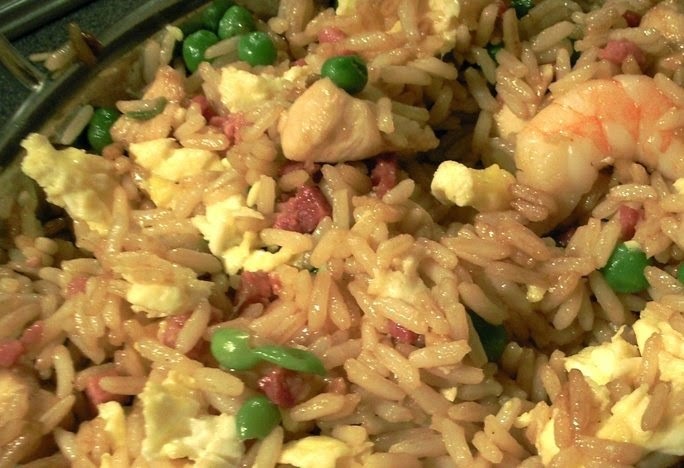 This is a really good recipe for special fried rice. It's just like the kind you get from a Chinese restaurant or take away. After taking bits from one recipe and bits from another - then doing my own thing, I came up with this. This is a really good recipe for special fried rice; it's just like the kind you get from a Chinese restaurant or take away. After taking bits from one recipe and bits from another - then doing my own thing, I came up with this. I have to say it wasn't bad at all and I will be making this again when I feel the need to eat Chinese! Please don't miss out putting the chicken in the marinade as this makes the chicken so soft. It will not be the same if you don't do it. It's true that you could get food poisoning from eating reheated rice. But it's not actually the reheating that's the problem – it's the way the rice has been stored before reheating. Uncooked rice can contain spores of Bacillus cereus, bacteria that can cause food poisoning. When the rice is cooked, the spores can survive. Then, if the rice is left standing at room temperature, the spores will germinate into bacteria. These bacteria will multiply and may produce toxins (poisons) that cause vomiting or diarrhoea. Reheating the rice won't get rid of these toxins. So, the longer cooked rice is left at room temperature, the more likely it is that bacteria, or the toxins they produce, could stop the rice being safe to eat.It's best to serve rice when it has just been cooked. If that isn't possible, cool the rice as quickly as possible (ideally within one hour) and keep it in the fridge for no more than one day until reheating. Remember that when you reheat any food, you should always check that it's piping hot all the way through, and avoid reheating more than once. Marinade the chicken cubes in the above for half an hour of more. Get your wok out, heat it up and add the oil. Fry the beaten eggs just for a few seconds - you don't want it cooked too much at this stage. Remove the egg, break into pieces and set aside. Fry the garlic for a minute, now, remove the chicken from the marinade, drain and add to the wok, stir fry until it is almost cooked. Now add the cooked rice and whilst giving it a good stir, add the ham, prawns, soy sauce, sweet soy sauce, white pepper and continue to fry the rice for a couple of minutes. Add the cooked peas and stir fry for a minutes or so. Make sure the chicken is cooked through. Now return the egg to the wok, it will cook in a few seconds. Stir for another minute or so. Serve immediately. Wonderful looking recipe Jan and great information on the danger of improperly storing cooked rice. Most people who are sick after having a takeaway blame a dodgy curry, when it reality it's probably the rice more than anything else! That was one of the first things we learned in Catering College. Anyways, well done you for a delicious and very informative post! I love fried rice. I'll have to have a look in tesco's for the sweet soy sauce. That looks amazing, Jan. I love fried rice. Thanks for the info about storing rice, I didn't know about that. Not that there's ever much left over around here. Wow, this looks so filling and delicious! It sounds like a tasty meal in itself, though I would happily eat this as a side, of course :). Great choice of ingredients. I would love to feature this recipe on our Demy, the first and only digital recipe reader. Please email sophiekiblogger@gmail.com if you're interested. Thanks!